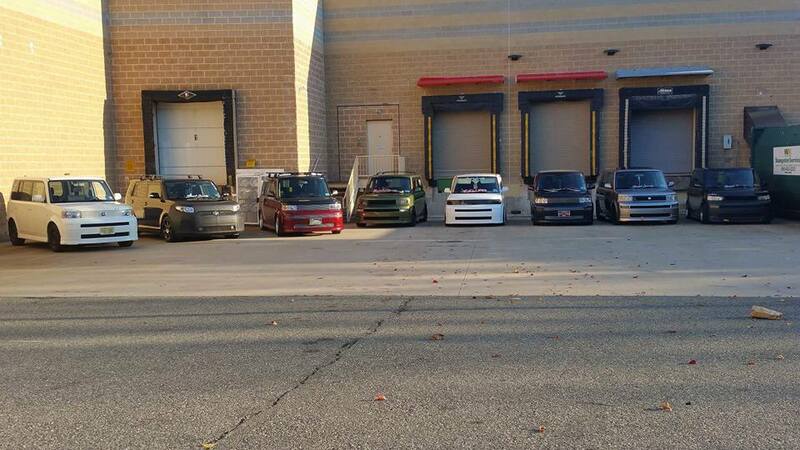 Scion xB Forum > Regional Meets & Events > North-East > Philadelphia Area Monthly Boxed Society Meets!!! Philadelphia Area Monthly Boxed Society Meets!!! Hey all! We are getting ready to start up our monthly Boxed Society Meets In the Philadelphia and Surrounding areas... Our Next meet is looking like March 12th. We havent hashed out the exact location yet, but as soon as we do ill be sure to post it up here... If your interested just leave a post and well get back to you! bori_XB, Lenin Parada and LadySerenaKitty like this. Re: Philadelphia Area Monthly Boxed Society Meets!!! Would a stock box from MD be welcome? Damn, looks like fun. Wish there was something like this out in Phoenix. absolutely you can come up. look for me, Bobby Nick on facebook, or look up the philadelphia boxed society on there. im pretty sure there are quite a few xbs out in phoenix. have you looked up scion xb customization on facebook? No, but that might be a good idea. I just don't see anything about recent meets / clubs out here. Um ... sure, but I'm not a facebook kitty. Is there a Google Calendar instead? Also, any ideas for bypassing tolls? I have a pass for US-40/Hatem Bridge, and I-95 at Newark, DE is a pretty simple bypass, other than that I'd get myself lost. na we do most of our stuff through facebook since most people use it nowadays.. you would have to google directions i guess and avoid toll roads. That's fine, I use Waze on my phone and it's really good at avoiding tolls. Guess I'll just have to check out the FB page to get myself Boxed In. Google Calendar would be great since it can be synced to smartphones, and tapping on a street address in the Calendar app will take you to your GPS app with that address already entered. At least that's how it works on my LG Escape2 (Android 5.1.1). sounds good. the guy who runs the page said it may take a day or two to accept your request since we are in the middle of changing the club name up.. if you cant find it look me up. my name is bobby nick. look forward to having you join! Cool, cool. I'll be joining on Mewday (Monday), probably. @ Speed Raceway Horsham from 12pm to 4pm. 1400 N Outer ine Dr.
Big Scion xB Meet including Food and drinks! Had a fantastic time yesterday. Great to meet everyone. thanks for the pics dave! It was nice meeting you as well! Any meetups coming up this summer? I'm in Vineland NJ so I'm just a tad less than an hour from Philly.